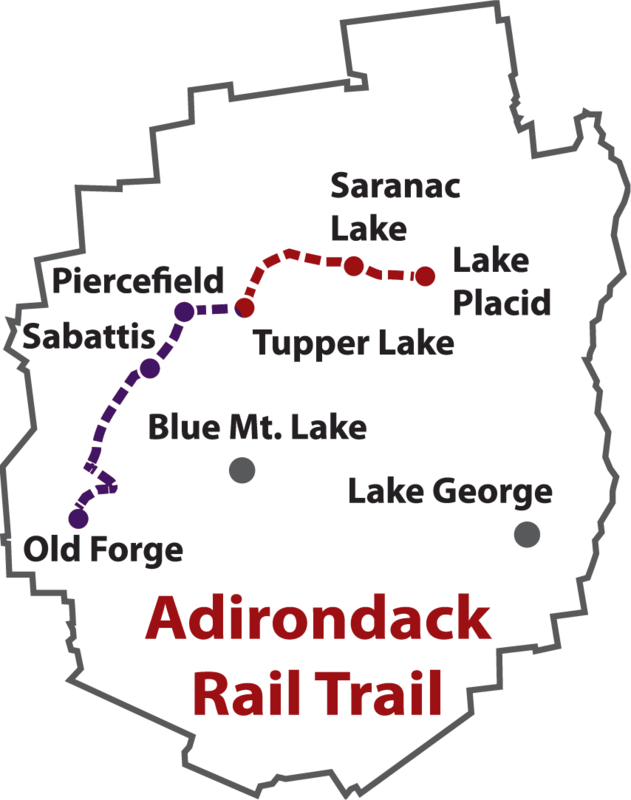 The Adirondack Rail Trail will consist of two segments of the rail corridor through the heart of the Adirondacks: the first segment, 34 miles connecting Lake Placid, Ray Brook, Saranac Lake, Lake Clear, and Tupper Lake has been approved for rail-trail construction by the Departments of Environmental Conservation and Transportation, and certified as complying with the State Land Use Master Plan by the Adirondack Park Agency. Construction on this segment should start by the first half of 2017. The 56 miles connecting Tupper Lake to Piercefield, Sabattis, Lake Lila, Beaver River, Big Moose and Old Forge has been proposed for expanded rail service but there are many steps to making that proposal real, including completing cost-benefit analyses, finding a responsible operator, and negotiating an operating lease that protects taxpayers against building a railroad to nowhere. Regardless of timing for the possible extension of seasonal tourist rail service to Tupper Lake, this section of the corridor will continue to be a part of the C7 snowmobile corridor linking Old Forge to the north. This rail-to-trail conversion will provide a major new tourist destination in the Adirondack Park and rank as one the finest multi-use, year-round recreational trails in the United States. The first segment will be surfaced with fine packed crushed stone for road bikes. The second section will continue to be a major connecting corridor for snowmobiles traveling through Tupper Lake and Piercefield to Tug Hill and north to Canada through Lake Clear. Construction of the trail will garner maximum economic benefit for the towns and villages along the existing rail corridor without more years of debate and delay. Tourists, seasonal homeowners and permanent residents will all benefit from the Adirondack Rail Trail. This safe, scenic, level recreational path will serve persons of all ages and physical abilities, including children on tricycles and training bikes, wheelchair users, elderly strollers, and parents running behind "baby joggers." It will cater to short-and-long distance cyclists, nature lovers and history buffs, runners, hikers, bird watchers and snowmobilers. Rail-trails are multi-purpose public paths created from abandoned railroad corridors. Most often flat or following a gentle grade, they traverse urban, suburban and rural America. Ideal for many uses, such as bicycling, running, walking, and wheelchair use, rail-trails are increasingly popular as recreation and transportation corridors. In this case, the Adirondack Rail Trail also provides for greatly improved snowmobiling and the attendant economic benefits. Rail-trails create healthier places for healthier people. They serve as wildlife conservation and historical preservation corridors, stimulate local economies by increasing tourism and fostering local business, offer safe and accessible routes for work and school commuting, and promote active lifestyles for all ages and levels of physical ability. In 1986, there were fewer than 200 known rail-trails. Today, there are more than 2,000 preserved pathways on former rail lines that form the backbone of a growing trail system that links communities, regions, states and, ultimately, the entire country. More than a thousand additional trails are in the works, with new projects beginning each month. The Rails-to-Trails Conservancy (RTC) serves as the national voice for this popular movement. RTC have concluded that a recreational trail on the Adirondack corridor will draw tourists and economic development to the region. RTC notes that we have the opportunity to offer a unique combination of fresh air, forests, wetlands, lakes, ponds, streams, mountains, wildlife, villages, museums, and all the services recreational users require, including a variety of lodgings and restaurants, all accessible on a year-round basis. The Adirondack Rail Trail will serve as a year-round recreational destination for people of all ages and capabilities. In so doing, it will add to the attraction of the Adirondack Park as a desirable place to vacation, own a second home, reside, work, retire, invest, and operate a business. The economic benefits of a recreational trail on the Lake Placid-Old Forge corridor will be very substantial. During most of the year, the trail will be used by bicyclists, walkers, joggers, hikers, and others, a large proportion of whom will reside outside of the region and be drawn to this region by the Adirondack Rail Trail. Their local spending will provide a major boost to the region's economy. As noted above, RTC based their estimates on equivalent trails' actual usage, forming a composit that gave them a range of expected visitors and spending. They estimate that the first section of the rail-to-trail conversion, utilizing the 34-miles of rail-bed connecting Lake Placid and Tupper Lake, could attract between 56,000 and 800,000 visitors annually, with a midpoint of 224,260 visitors. Out-of-area visitors will spend between $63.86 and $99.30 per day, with an average of $86.02. At the midpoint spending level, visitors will add $19.8 million in annual revenues to the local economies. Local trail users will add $1.8 million in trail-related spending. Some have criticized those estimates as derived from experience with rail-trails located near major metropolitan areas. In fact, the RTC analysis was largely based on experience with trails located a substantial distance from large urban centers. The Pine Creek Rail Trail is located northeast of Williamsport, PA. The Ghost Town Trail starts 70 miles east of Pittsburgh, PA. The Virginia Creeper Trail is located in a remote region in southwestern Virginia. The trails from the RTC analysis with connections to major urban centers are the Great Allegheny Passage, a 145-mile trail which starts outside of Pittsburgh, PA, the 21 mile Heritage Rail Trail County Park, which starts in York, PA and connects to the Torrey C. Brown Trail in Maryland that extends twenty miles to a Baltimore suburb. Examining the RTC report, experience with trails with no urban connection is impressive in terms of the economic growth brought to the regions, with average total annual trail-related expenditures of nearly $3,000,000.